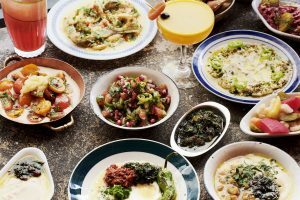 Sushisamba has somehow managed to blend three totally different cuisines together – keeping with tradition in some dishes while getting experimental with plenty of others. Chefs are inspired by Nikkei; the blending of Peruvian and Japanese food that came about from the large Japanese migration to South America in the 19th century. But, wanting to add even more to the experience, Sushisamba chefs have also mixed in Brazilian cooking – primarily due to the large Japanese population residing in Brazil as well. The result of these pairings is simply spectacular. Just prepare to be overwhelmed by the sheer mass of food offerings. The menu is long. And you may not know what a lot of the dishes actually are. Thankfully, the front-of-house team are all experts. And there is an army of them. They rush about the two-floored restaurant and bar high up in Heron Tower, making sure each and every guest is dutifully taken care of. The lobster taquitos are to die for! We recommend you trust your waiter. Point out a few things on the menu which stand out and then let them pick and choose a banquet catered to your own tastes. They’re like personal shoppers, but for food. That said, there are a few things diners shouldn’t miss out on. The green bean tempura with black truffle aioli is an easy win to start off with. The light batter, fresh crunchy beans, and tasty dip can easily be munched on throughout the evening. The shrimp tempura, a slightly larger dish, must be ordered as well. It is similar to the beans but each perfectly cooked prawn is coated in magical spicy mayo sauce that will make you moan with pleasure. After all, food can be somewhat sexual too. 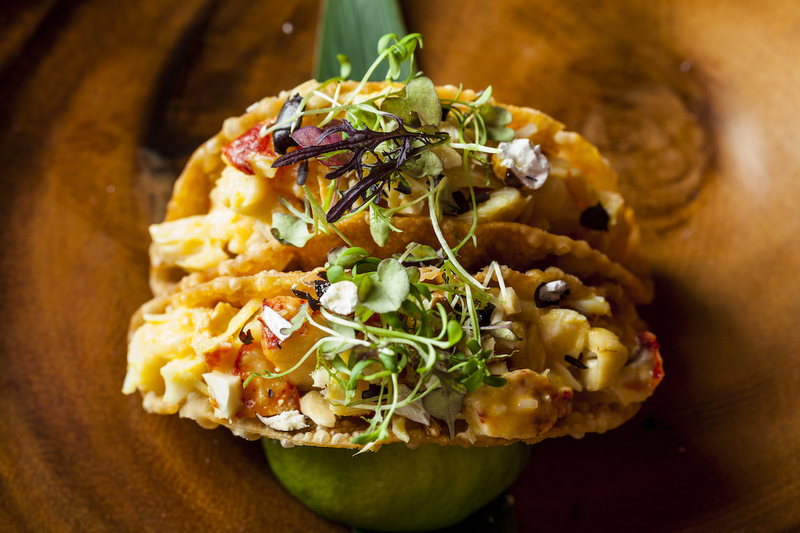 Taquitos are then served up on Sushisamba branded bricks and are one surprising highlight. We went for the lobster iteration to really take advantage of the stellar seafood offered here. It was served up like a taco, filled with avocado, aji Amarillo, jalapenos, lime, maize and morado. Sushisamaba is also famous for its sushi rolls and sashimi. The unique El Topo rolls were as strange as they were delicious. Served warm, the rice was covered in salmon, jalapenos, crispy onion and melted mozzarella. You could easily stop at this point and be satisfied by the amount of food you’ve packed away, but leaving out the larger dishes would just be foolish. This is where they turn up the dial on experimentation and impressive use of different culinary techniques. Take the black cod for example. The sweet and buttery flesh falls apart on the plate and is paired with all kinds of corn-based extras. Carefully grab some of the cod with your chopsticks while adding polenta, maize morada sauce and popcorn. You might need the help of a fork for this one – no judgment here, folks. Meanwhile, meat lovers need to get around the churrasco Rio grande; a divine medley of meat. The large wooden board is generously covered in ribeye, chorizo and aged picanha beef. And each is paired with its own little side. There’s a bowl of black beans, some fresh salsa with greens and a delicious herby sauce. But if you are a high flyer wanting to impress, then order the Kobe beef. This rare variety of fatty Wagyu is deemed one of the best meats in the world. And, with that ranking, comes a hefty price tag. One kilo of Kobe will set you back £1,000, while other Kobe dishes are only nominally cheaper. Each is served with its own bronze medallion and a certificate of authentication from the Japanese Kobe Beef Marketing and Distribution Promotion Association. 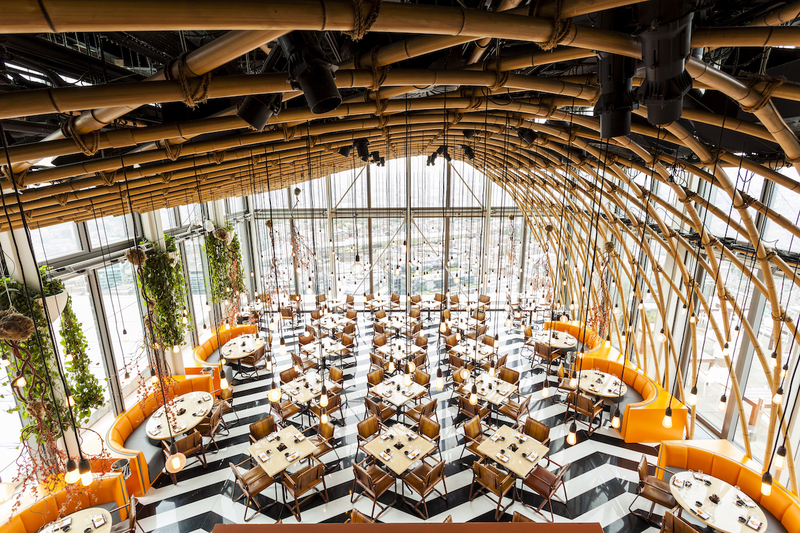 Even though Sushisamba boasts incredible food, some of the best views in London, a huge number of highly trained staff, and use world-class ingredients, it is far from a pretentious dining destination. The entire environment is fairly relaxed (even if there are a lot of suits in the room) and the music is lively and upbeat. 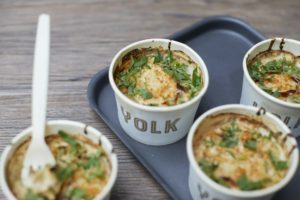 It’s a place where you feel comfortable to treat yourself to something special, but you can also sit back in your seat, breathing heavily in between courses, as you try to build up the willpower to continue feasting on all manner of delicious creations.